Wonky 9 patch -- the binding will be the same as the border. I forgot to check what this is called but it reminds me of Quilters Suede that was out in the 90's. And, finally, Simply Squares. 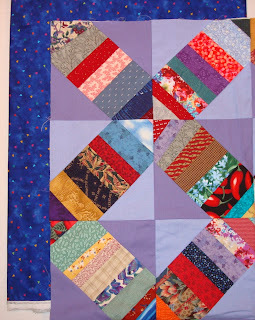 This was a mystery quilt that I tested for Marge. She now sells the pattern on her relay site to benefit cancer research. I'm not putting a border on this one. 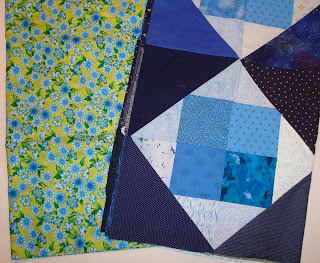 I thought this would be a bright backing for this dark, medium and light blue quilt. Now, I need my Nolting 18" to arrive and for me to get proficient at it. I'm sure I can do a nice stipple but I'm going to want to do some thing more involved with some of these. I've got a small border to put on the streak of lightning I have been working on and then find a backing in the stash. It'll be my first attempt on the new machine. I've also found a panel of green with houses and streets and such on it. 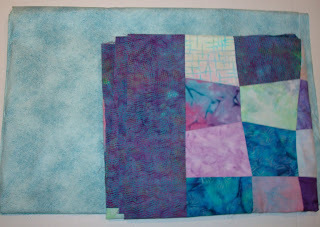 I think I'll make a backing out of pieced blocks and then quilt it around the streets and buildings. The rain has started up again. I think we had two days with no rain but now it is raining pretty hard. Time to read email, surf a bit and then start in on my recent book. Happy Quilting All. You have some wonderful fabrics there. Looks like you were careful in your fabric choices and only bought what you could use up right away. Some lovely finishes are in you future.